What is your opinion? Many clothing companies really wish to know. In advance of the busy shopping week ahead.. many fashion retailers are looking forward to consumer thoughts. Here are a few stats regarding online reviews. In 2015, the average shopper spent $800 during the holiday season, with 40% of shopping occurring online and 21% of shoppers using their mobile devices to make purchases. This year, US shoppers are projected to spend over $655.8 billion in November and December alone, with $117 billion in online sales. This is no doubt an important time to ensure your customer service skills are on point to retain customers and solidify their business for next year – especially as negative reviews tend to increase immediately following major shopping days. 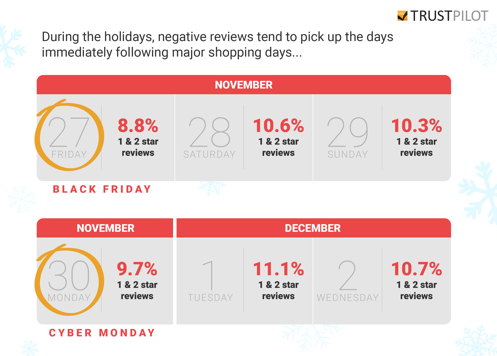 According to data from Trustpilot, the leading online ratings and reviews community, online reviews spiked 35% daily, with 52% earning more 1 & 2 star reviews, with negative reviews not returning to normal levels until halfway through January. Online businesses have a lot to gain during the holiday season, but it is critical to stay on top of customer experience during this busy time. Do you own a fashion boutique, shoe store, or e-commerce clothing store? If yes, you may want to learn about ways retailers can increase efficiency, grow revenue and future-proof their business during this holiday season. Surveys and market research may be the way to go. Take a moment to learn about TrustPilot and see what the online review community can do for your business.